The second hotel I am staying in Bangkok is "The Continent Hotel, Bangkok", located in the city center in Sukhumvit Soi 21, just right beside the BTS station Asoke. The location of this hotel is spectacular, with Terminal 21 (an incredible mall with traveling theme) and bars/ clubs around. As it is in the city center, you can easily get everything you need around so dining, shopping, nightlife will never be a problem. But what The Continent really catches my attention is their rooftop infinity pool and their amazing city view. 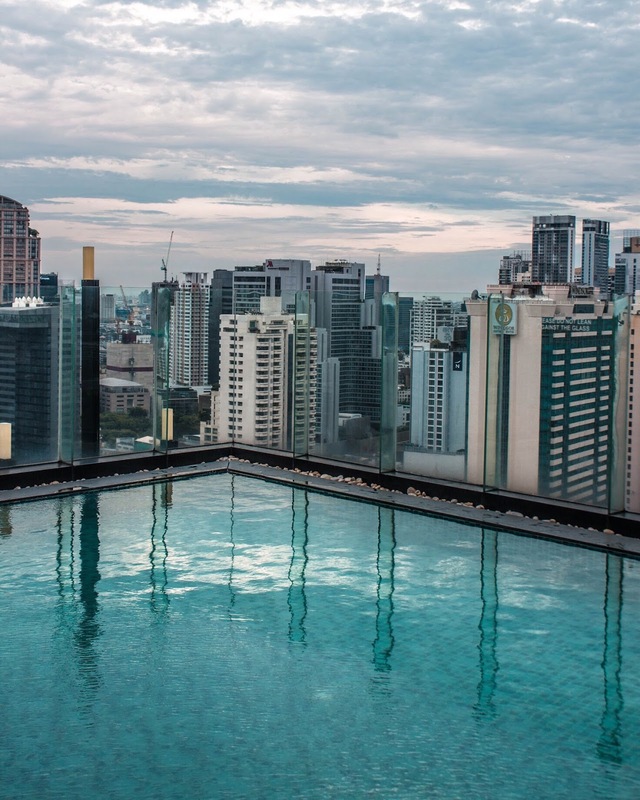 The swimming pool is located on the 37th floor which is basically the rooftop, the swimming pool isn't big, but it is connected to the pool bar (H2O) and the skyline of Bangkok. There are some sun tanning chairs and beds near the pool, I did not get a tan because the weather was quite cloudy, but it is definitely a good place to relax. There are glasses around the pool which blends in with the view behind so it looks like an infinity pool; the corner of the pool has the best view and the widest scope of the city which is the top spot for a photo shoot (either the skyline or you sitting by the pool). The weather is Bangkok fluctuates a lot, so even though it was pretty cloudy that day, I still managed to get a sunset photo as patches of sunlight shine through the clouds as the sun sets. There is also a set of chairs and bar table right at the glass by the pool, which is the best spot to relax and have a cocktail, definitely better than any Skybars. I am staying in the Continent Sky Room which locates on the higher floor of the hotel, and when I say higher floor, I mean the height enough to overlook the whole Bangkok city just by standing near the window. No matter day or night, the view in my room is impeccable and breath-taking; I watch the city sleeps and wakes, and every minute I stare into the window is never dull. 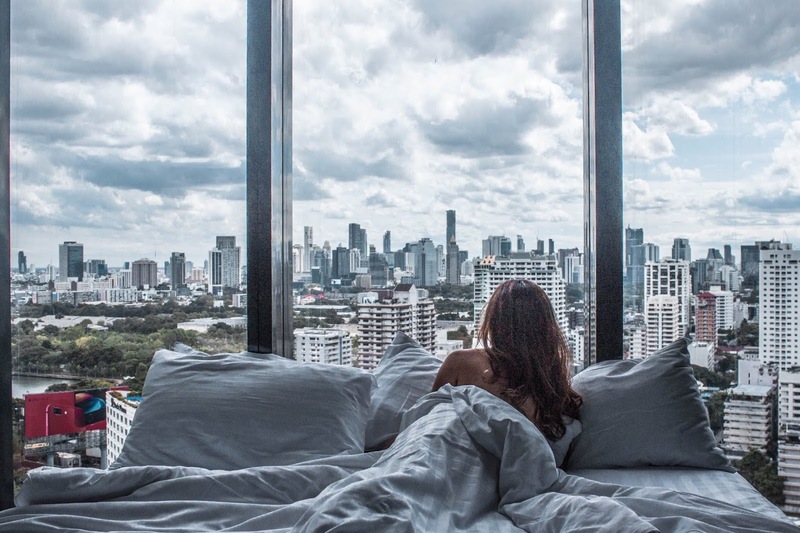 The best thing about the room is that the floor-to-ceiling windows actually surround to room in a V-shape, so basically you are enveloped by the view of the city once you are in your bed. During my stay, I never shut the curtain, I am so obsessed with the view I actually push my bed towards the window and watch the sun rises. What can I say? The transition from night to the morning in this city is stunning and memorable. The bathroom isn't big, but it has everything I need for relaxation and pampering. As you may know, I have a very high standard when it comes to the bathroom, everything has to be on point. For this bathroom, it has a bathtub overlooking the view of Bangkok (bathtub is essential for me when it comes to choosing hotel), that is definitely a cherry on top of icing. With that spectacular view and a large bathtub, a pampering bath is always a YES for me. With all the traveling and working, a bubble bath is the least I could do for a relaxation; so what I did is I threw in a Lush bath bomb with some of the shower gel provided by the hotel (which smells amazing by the way) and hop in. This is actually how I spent one of my evenings, hopping in a hot tub of bubbles with a glass of champagne, watch the night falls and fall asleep in the tub. Another amazing feature I enjoy is the services provided by the hotel. The room that I am staying in includes several benefits including complimentary minibar (I know right) as well as complimentary drinks at the pool bar and lounge. During my stay, I can honestly say I have been treated like a queen, randomly snatching snacks and drinks from minibar because how often do you get to even touch the food in the minibar? The benefits do not stop here; if you are a person who takes hygiene seriously (which everyone should), they also provide laundry service for 2 pieces of clothing daily. Though I did not use their laundry service as I usually travel with more clothes than I actually need, it is still a very heart-warming service. The hotel also provides limousine services (booking in advance is needed) to and from the airport, which is very thoughtful and convenient. I used their limousine services to travel to The Continent from another hotel, as well as to the airport for both my departures to Phuket and back to Hong Kong. Thier limousine services are amazing, the cars they use are very comfortable and spacious, which is perfect if you are traveling with your family. They also provide water and juices in the limousine so do not worry if you get thirsty on the way. To be honest, I am impressed with the dining options in The Continent Hotel. 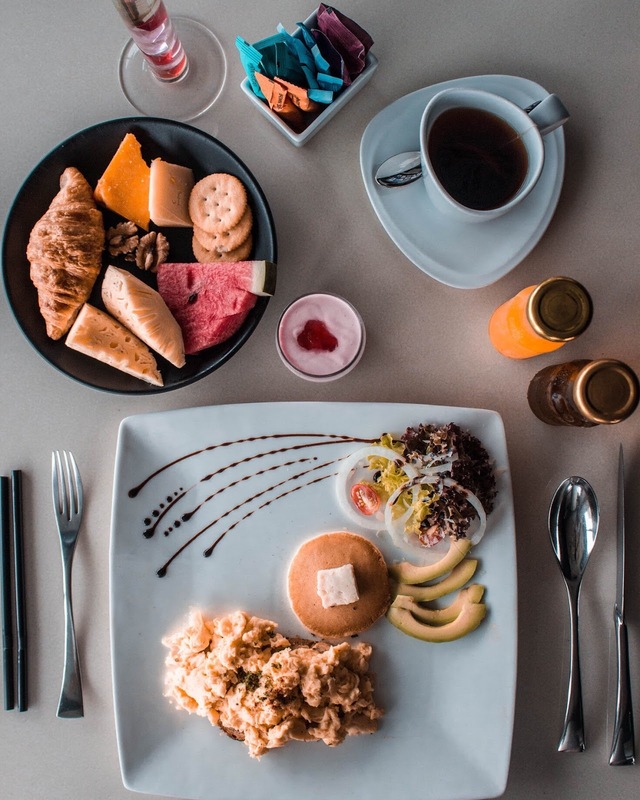 Most of the time, the thought of dinning in a hotel sets people back because they immediately think of how expensive it is going to be with only a mediocre food quality. 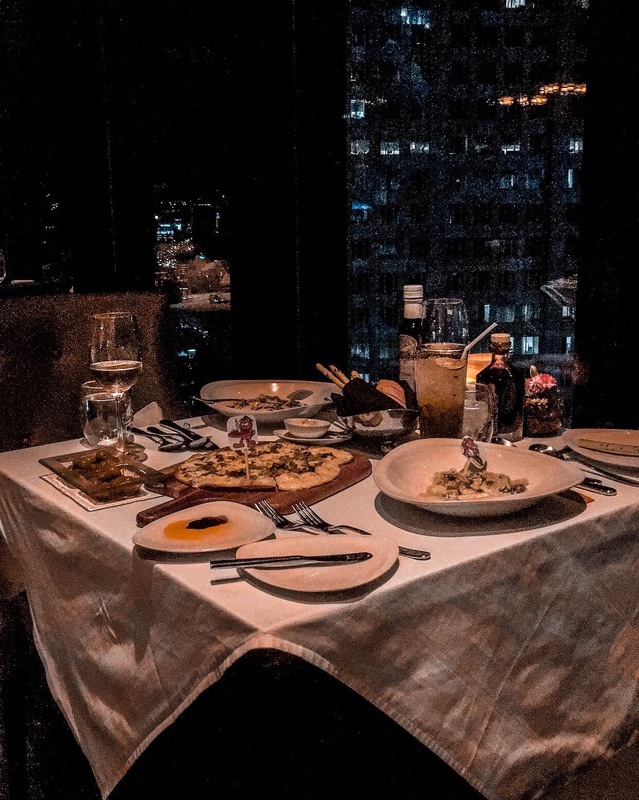 This is a total different story when I dined at Medinii, an Italian restaurant located on the 35th floor. The restaurant has a stunning night view (to be frank the entire hotel has a stunning view) with a rather new dining concept-- free flow of pasta and pizzas. 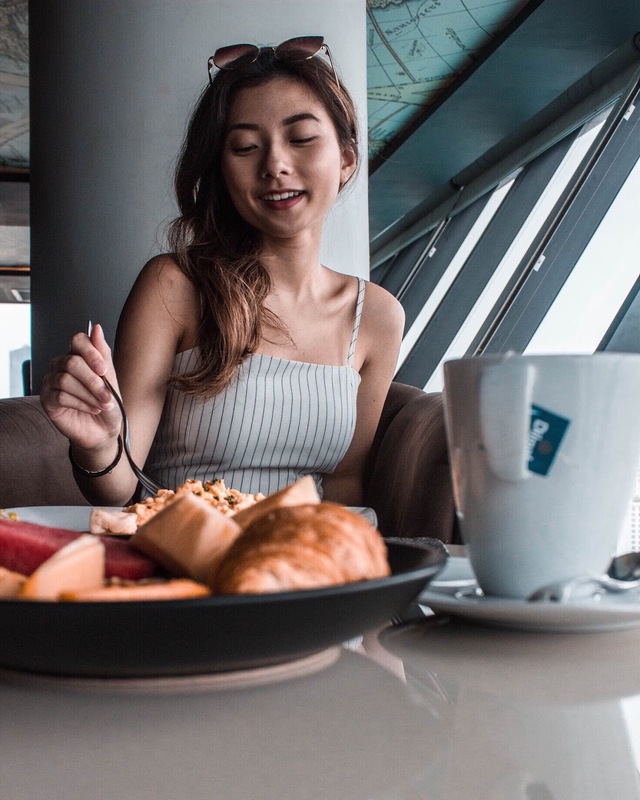 The Continent Hotel provides two kinds of breakfast, a breakfast buffet on the 35th floor or an a la carte breakfast on the 38th floor (which can be turned into a co-working space at the same time from 9am to 5pm). As I always have breakfast buffets in a hotel, I decided to try something new (a la carte it is!). There were quite a few options on the menu but my preferred choice is always with scrambled eggs. Their a la carte breakfast did not fail to impress at all; when the plate was served on my table, I was really impressed by the plating and the food combination. They also offer ham and cheese, fruits and juice which are self-served at the bar table. Overall, the breakfast was very impressive and of very high quality. The sky lounge is very comfortable as well, overlooking the city as well as the pool. In the beginning, each and every customer will be asked to order a main course and a dessert (one dish per category). The entree is usually soup (which I had pumpkin soup) and I chose my main course to be a rib-eye steak (I am such a beef-person) and my dessert to be creme brulee (one cannot resist a creme brulee). It actually quite the amount but I haven't mentioned their freeflow yet. 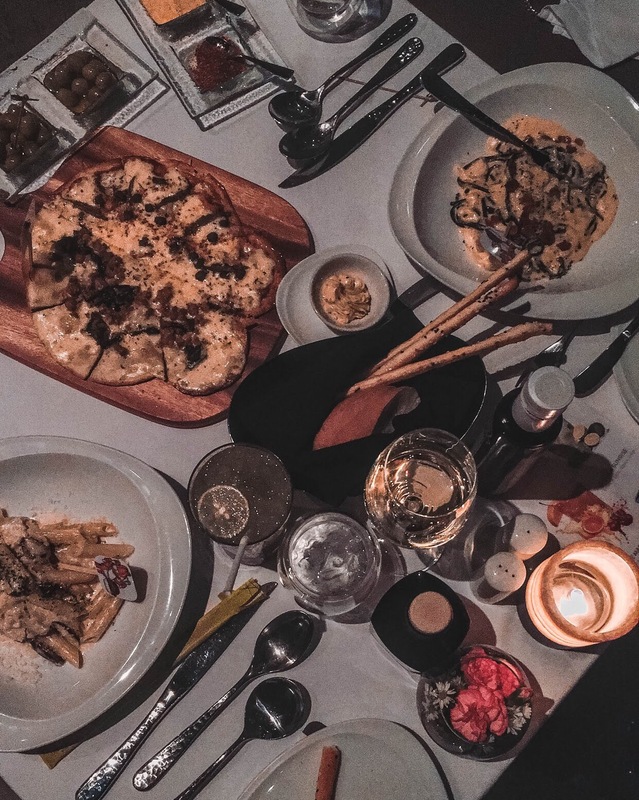 Their freeflow includes a wide selection of pizzas and pasta, as well as cocktails and wines. I am really impressed that they actually provide a variety of selections on their freeflow menu and the price is not expensive at all, it is totally worth it! This is a rather new dining concept (at least to me) as where I come from, there are a lot of buffets and all-you-can-it, maybe freeflow of drinks and fries but never pizzas and pasta. The meal was amazing and the food quality was exemplary. One interesting thing is that the restaurant actually uses Garfield as their theme, and they are celebrating Garfield's birthday at dinner time; so don't be surprised if you see Garfield sticking out of your pasta! What do you think of this hotel I am staying in? Any great hotel or experience to share? Tell me what you think, I would love to know! If you haven't already, check out my previous post about the first two nights of my stay in Bangkok!